For building u-boot, use the "INet_86VZ" target. This device comes with only a single USB port, and has no separate power connector. It therefor is only of limited use as a standalone desktop style device, as connecting a keyboard and/or mouse will only work as long as the battery lasts. Currently (20140117) NAND access is not possible in our sunxi kernels. This is because the Samsung K9GBG08U0M is not known by libnand. A patch exist which adds support for this NAND chip. That patch should be integrated soon. Awkwardly, the Freelander PH20 default image came with a 16MB boot partition, but the FAT filesystem on it thought it was 128MB large. You will have to create a fresh FAT filesystem when installing to NAND. 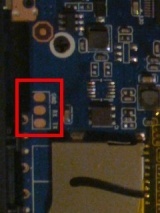 This device exposes a nice set of pads on the mainboard, but there's a catch. These pads are wired to the SD controller, and you can choose, either have an SD card, or have serial. You cannot have both. Here is a record of how i had to bend backwards to get this solved. Now gently insert your plastic tool in the space between the connector face and the back. You should soon hear the plastic clips popping. Be careful when removing the back, as the speaker is lightly glued to it. There are nice pads labelled "GND", "RX" and "TX" below the SD card. All you have to do is solder on some wires. This page was last modified on 16 January 2015, at 23:26.